Welcome! This is a community for fans of the "McShep" pairing featured on the sci-fi show Stargate Atlantis. Images from the show and the actors will be posted each week. You'll have the opportunity to design your own icons based on the pictures provided. Voting will take place at the end of each challenge to decide which icon people like the best. Banners/awards will then be created for those who achieved a placing in the challenge. Don't take yourselves too seriously, and remember that icons are love. You do not need to be a community member to participate, but this may change in the future. Please read the rules before joining. Please note, the rules may change with specific challenges. 013. If you are interested in using one of the submitted icons on your personal journal, please comment on the voting post and I will get ahold of the creator and make sure that's alright. 014. Most importantly: Have fun! Challenges end: The following Monday. Winners announced: Friday - Saturday, depending on ties. Banners posted: The following Monday at the latest. Awards will be given to first, second, and third place winners based on points. 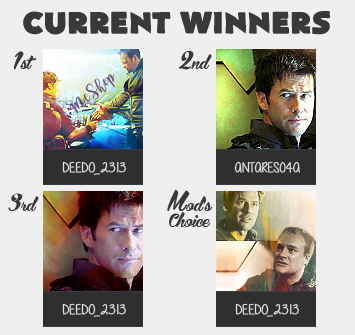 Each voting poll will allow members to select their choice for First, Second, and Third place. First place votes count for five points; second place votes count for three points; third place votes count for one point. The amount of points each icon earns will determine First, Second, and Third places. Special categories that may show up depending on the number of entries. These will be outlined in the voting entry. Community header image created by a_gal_icons.